The combined poems by these two writers scarcely exceed 800 lines, making this volume a manageable text for an undergraduate Greek class. It is an excellent introduction to Hellenistic poetry. The epigrams convey a good sense of the Hellenistic ethos without posing some of the daunting vocabulary problems of the major authors of the period. Jerry Clack's translation and annotated text well serve the reader with an interest in Hellenic culture as expressed in the epigram. […] this text provides the neophyte with insight into not only the genre of epigrammatic writing, but also to the age and culture which engendered the genre, as well as to its otherwise inaccessible scholarship today. This text will be welcomed by teachers of undergraduate Greek students who seek a lively and effective introduction to Hellenistic poetry before tackling more challenging Hellenistic authors such as Callimachus and Theocritus. 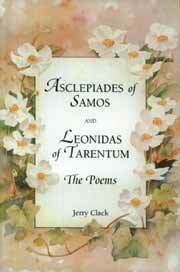 Clack's book may also be used expediently in conjunction with his previously published edition of Meleager's poems.